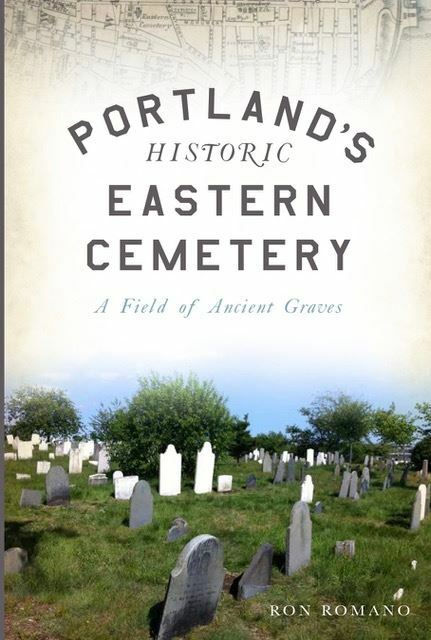 The History Press has just released Ron Romano’s second book, entitled Portland’s Historic Eastern Cemetery: A Field of Ancient Graves. This book celebrates Portland’s 350-year-old burial ground, which is on the National Register of Historic Places. Many MOCA members visited the cemetery in July when the cemetery’s friends group, Spirits Alive, hosted the MOCA summer meeting. Chapters include “Lost at Sea,” “The Dead House,” and “Five Men Hanged for Murder.” The book also examines how the minority populations of African Americans, Quakers, and Catholics were treated by the town. Romano is offering MOCA members free shipping on autographed copies of the book. Contact him at roroman@maine.rr.com for further details. From Friday, September 8 through Monday, September 11 cemetery conservator Joe Ferrannni of Grave Stone Matters, based in Hoosick Falls, New York, will be working with the Ridge Association and a group of pre-registered participants at a workshop to preserve some of the stones in Ridge (aka South Parish) Cemetery in Martinsville. Ferranni will demonstrate a specific technique and then under his tutelage those participating in the workshop will have the opportunity to practice the technique as they work to preserve some of the gravestones in this cemetery. Depending on the condition of the stone various techniques may be required. Among the skills covered will be using correct materials and techniques to clean stones, straightening leaning stones, resetting stones in their current bases, making new bases as necessary, replacing rusted pins, repairing using epoxy and infill, and other preservation tasks as the workshop continues and specific needs are discovered. Documented direct descendants of any of the persons buried in Ridge (aka South Parish) Cemetery in Martinsville (St. George) Maine who do not want their ancestor’s stone preserved by this group should contact Joyce Davies by August 31, 2016. The Ridge Association, which cares for this cemetery, has already authorized the work. 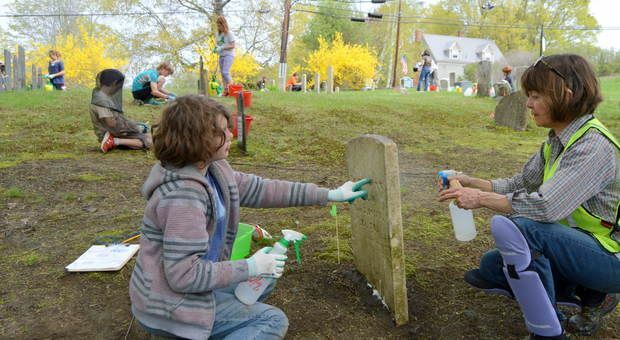 WILTON — Fifth-graders from Academy Hill School in Wilton and Cascade Brook School in Farmington cleaned stones in the Academy Corner Cemetery on Wednesday. But, it was more than just a lesson in cleaning. The project, called Stones with Stories, challenged their language arts, math and history skills. Their work will culminate in a map of the cemetery that plan to give to the town, teacher Sarah Reynolds said. The project resulted from the Maine Old Cemetery Association workshop at the Weld Road cemetery last summer, Deb Probert, association member, said. Town Manager Rhonda Irish thought it would be good to involve schoolchildren in cleaning the stones. Students previously visited the cemetery on the opposite corner of Main and Depot streets. After cleaning each stone, they compiled information, including names, dates and inscriptions. Jonathon Flaherty, a student at Cascade Brook School, discovered a potential error on a stone. Prior to cleaning, the name appeared to be John Hay but the clean stone indicated the name was John Day who died in the 1800s. Probert assured him the name would be researched. The students' history, literacy and writing skills were stretched as they researched the person or family whose names were on the stones and wrote about them and the period in which they lived, Reynolds said. Lucinda Carroll, a student at Academy Hill, relished the research task and is creating a snapshot of the Morse family, Reynolds said. Four members of the family died within four months from typhoid fever, the result of contaminated water, Carroll said. Maxine Brown of the Wilton Historical Society said there was an outbreak of typhoid fever in 1816 followed by another in 1830. The cemetery dates back to 1816, maybe 1810, she said. The are 38 stones that are visible and some may be buried. The cemetery sign says Academy Hill Cemetery but it is actually Academy Corner Cemetery, she said. The school across the street was originally the Academy Freewill Baptist Church which was built in the mid-1800s. Many buried within the cemetery were likely members, she said. The large, open barn-type building later became Wilton Academy, which burned in 1980, she said. A photo of the original church is on display at the society's museum. There are three veterans buried in the cemetery, she said. Two are veterans from the War of 1812 and one is from the Revolutionary War. The Maine Old Cemetery Association wants to "foster interest in the discovery, restoration and maintenance of Maine cemeteries and to preserve records and historical information which relates to them," according to its website. Each summer, the Maine Old Cemetery Association hires Joe Ferrannini, owner of Grave Stone Matters, to teach attendees the basics of stone cleaning and repair. The cemetery restoration expert hauls his business-on-wheels to Maine from upstate New York, carrying everything from rinse water to a tripod and chain haul to raise and lower stones weighing hundreds of pounds. The two cemetery workshops this year are in the Franklin County towns of Industry and Wilton. At the West Mills workshop in Industry, workshop leader Joe Ferrannini guided participant Albert Stehle, of Bowdoinham, in proper techniques to straighten veterans' stones after repairing damaged bases. INDUSTRY — The rural West Mills cemetery has very few visitors, although it serves as the final resting place for many of the area's founding families. For four days in August, all of that changed as their headstones were scrubbed and their bases straightened and repaired. 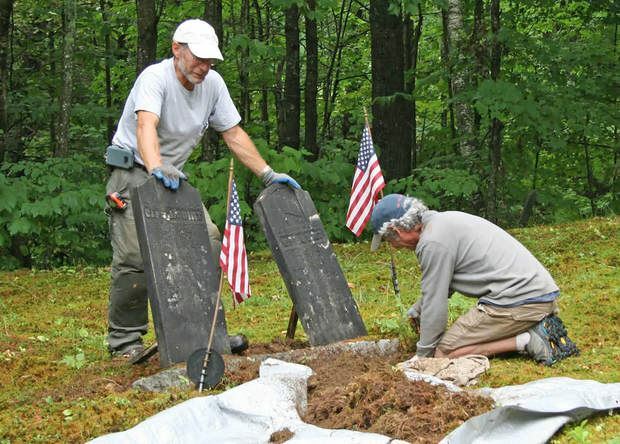 The Maine Old Cemetery Association scheduled two cemetery restoration workshops in the state this year, both in Franklin County. The first group of two dozen attendees gathered on Friday morning at the Industry Fire Station for an orientation. Before getting to the historic West Mills cemetery on the Shaw Road, the downpour soaked them and their buckets of tools. Undeterred, MOCA representatives Cheryl Willis-Patten and Jessica Couture, along with restoration specialist Joe Ferrannini, owner of Grave Stone Matters, carried on with their plans. Participants learned how to clean the acid-rain darkened stones, repair a few of the damaged stones, and, as instructor Joe Ferrannini cautioned, "Do no harm." Joe, who lives in Hoosick Falls, New York, loves to come to Maine to teach these workshops. He considers this work a second career that suits his passion for history, genealogy and old cemeteries. With a college degree in mathematics and history, he spent 20 years with trucking companies, but decided to take a chance. "In the worst economy we've had for years, I decided to start my own business," he said with a laugh. He hasn't regretted that decision and has been able to travel the region and work with eager volunteers and municipalities who want to preserve their town's history. He suggested methods researched, tested and used by the experts in care of veterans' stones and markers. The National Park Service and the Department of Veterans Affairs National Cemetery Administration oversee thousands of veterans' gravestones and markers and they offer helpful directions for those who care for gravestones. Why would anyone want to clean a gravestone? The simple answer is to preserve the artifacts of the past. 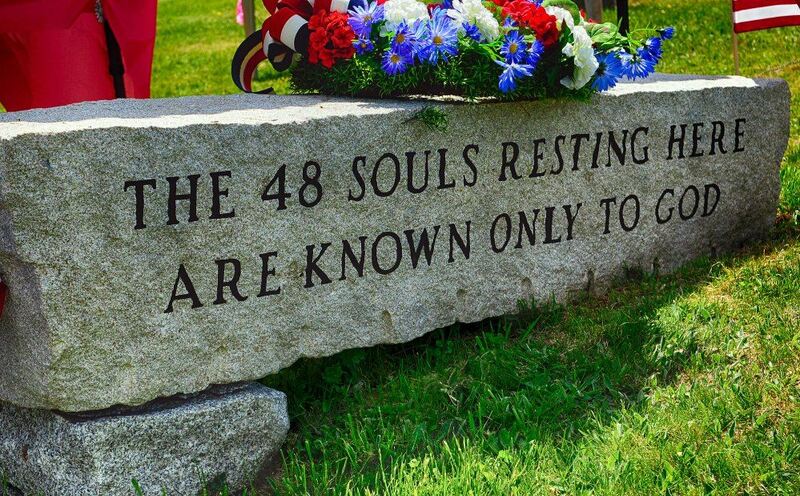 Many of those gravestones and monuments belong to veterans who fought and often died for their country over the past four centuries. A headstone is intended to honor the deceased and should be treated with respect, Willis-Patten said. Over time, it takes on different meanings for those who visit, and reminds citizens of the many veteran's who have served their country. Ferrannini told attendees he adheres to a few strict rules for cleaning. "Never power wash, and never, ever use wire brushes, sanders or grinders to clean a stone's surface," he said. Marble, for example, is very porous, and when the surface is cleaned with abrasive tools and chemicals, the patina is damaged permanently. Grains start to loosen and wash away, and the surface develops a sugary coating and discolors more easily. Inscriptions will erode, making the headstone harder to read. Headstones in shady and damp areas may need to be cleaned more frequently than headstones in sunny areas. Stone cleaners should take a picture, if possible, to document the before-and-after cleaning results, and keep a record of the dates, locations and the information carved on each stone. Ferrannini also showed how to use a mirror to reflect the light across the face of the stone to make lettering easier to read. Albert Stehle, a mason from Bowdoinham, said he has gone to other MOCA workshops and said he's becoming more interested in following in Ferrannini's footsteps. "My Ridge Restoration business includes repairing old houses and chimneys, and I really like doing this," he said, as he dug the old mortar from a broken headstone base. "It's important to take care of these old stones." Ferrannini says he uses D/2 Biological Solution, the preferred cleaner for the National Park Service and Department of Veterans Affairs. In Maine, the cleaner is carried by A. H. Harris & Sons in their Augusta, Portland and Portsmouth, New Hampshire, locations. "Marble cleaned with biocides can continue to lighten over the next few months, so be patient," he advised. "Don't expect stones to look new, since they are, in some cases, hundreds of years old." Attendees were advised to use gloves and eye protection and avoid splashing the cleaner during spray applications. A three-person team can clean many stones quickly and efficiently, with one wetting the stone and spraying the cleaner, one brushing or scrubbing the stone, and one rinsing the stone. The process requires a lot of clean water. If the cemetery does not have clean running water, bring plenty of extra water to the site. Ferrannini refers beginners to "A Graveyard Preservation Primer," written by Lynette Strangstad. The book is a valuable resource for methods of protection and preservation of historic graveyards. Much information found in the first 1980 publication has been updated to include technology and digital tools. See MOCA's Workshops for more information about cemetery education opportunities. 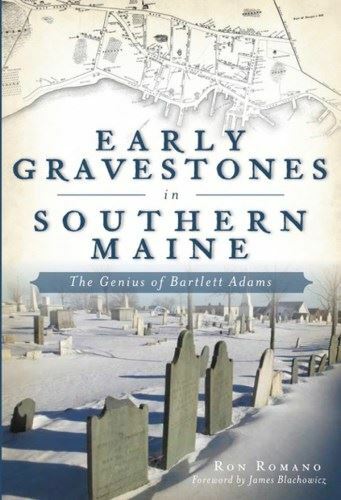 Maine native, historian and MOCA member Ron Romano is pleased to present his new book on stone-cutter Bartlett Adams (1776 - 1828), whose shop produced nearly 2000 gravestones found today in 135 ancient cemeteries across southern Maine. This well-illustrated book includes many examples of Adams’ artistic flair, and highlights the other skilled carvers who worked in his Portland shop. Discover the grief that Adams poured into the stone markers for his own children, read the heart-wrenching story of the 16 souls lost on the wreck of the schooner Charles, and learn about the national recognition Bartlett achieved for his work on the memorial for a hero of the War of 1812. The book is available in bookstores, on-line at popular book-selling websites such as Amazon and Barnes & Noble, from the publisher (The History Press), and directly from Ron. Buy your copy directly from Ron (at $21.99), and he will autograph it and ship your book for free! To take advantage of this special offer, email Ron at roroman@maine.rr.com for an order form. The website is published using the Wild Apricot member management platform. 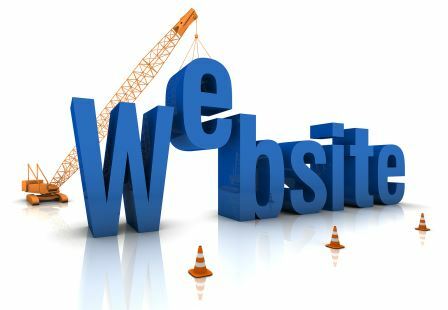 This product has many unique features but the new skills you learn will also apply to websites built on similar platforms such as Drupal, WordPress, etc. For additional information contact Debi Curry, MOCA Web Steward. Scheduled walking tours of Portland’s historic Eastern Cemetery, founded in 1668, will begin again on Saturday, July 9 and continue each Wednesday, Saturday, and Sunday at 11 am through October 16. These tours, which last up to an hour, are led by trained volunteers, who cover the cemetery’s history, prominent historical figures, and early gravestone art. Ticket info: $10 adults, $5 students and seniors (65+), kids under 12 are free. Tickets are available at the gate at 224 Congress Street on the day/time of the tour, or anytime in advance on the Spirits Alive website or at EventBrite. Off-schedule private tours are also available through the website, at no extra charge. Proceeds are used to conserve Eastern Cemetery's historic gravestones. 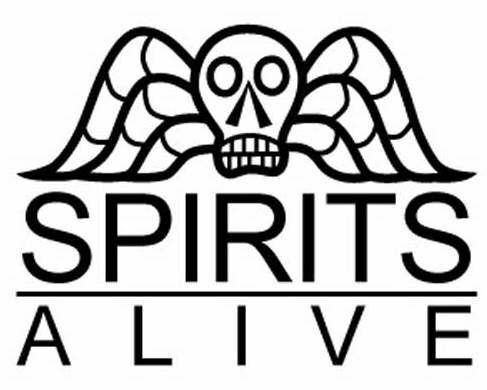 Visit SpiritsAlive.org/tours for more information. “It’s so peaceful here,” whispered my six-year-old granddaughter, her fingers and lips stained red with the juice of June’s wild strawberries, plentiful in the grass among the gravestones of Weld Street, Wilton’s Old Town Cemetery. I’d stopped to inventory the damage that weather, time, and neglect had wrecked on over half of Weld Street Cemetery’s two hundred gravestones of Wilton’s settlers. I wished to share with her the earliest, those of her fifth great-grandfather, Samuel Hiscock, buried in 1815, and of her fifth great-grandmother Betsy Teague Hiscock Wheeler, who came to Wilton (then Tyngtown) from Damariscotta in 1808, and raised a family of five sons here. We lingered for more than an hour, she eating strawberries, finding lilies of the valley blooming at the woods’ edge, spotting birds amongst the trees, and reading names on headstones, while we chatted and I sadly recorded damage to more than one hundred gravestones. My intent was to procure a Maine Old Cemetery Association (MOCA) conservator-led 2016 Gravestone Preservation Workshop at this location, convenient to all the folks in Western Maine’s many small, rural communities. Now MOCA’s 2016 Preservation Workshop Registration is Open! 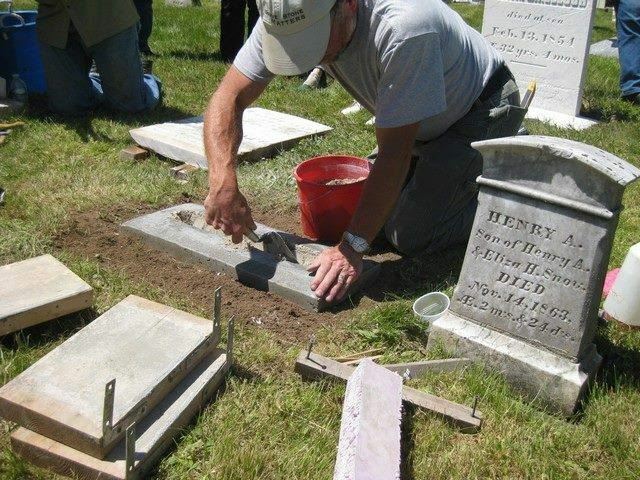 You may attend one to four days, August 19-20-21-22, of hands-on work under the leadership of cemetery conservator Joe Farranniini of Grave Stone Matters based in Hoosick Falls, NY. Joe’s profession is rescuing abandoned cemeteries, assessing cemetery work, mapping/documenting cemetery information, resetting stones, straightening stones, repairing broken stones/bases/pins, epoxy repair and infill, resetting fallen monuments, and leading training workshops. I registered for Joe’s 2014 four-day MOCA workshop at Old North Parish Cemetery, Wiley’s Corner, St. George, simply because I’d discovered that one of my few Tripp family ancestors with an engraved headstone was buried there… and her stone was broken. The camaraderie developed among workshop participants, the skills learned and practiced, and the cleaning/restoration of nearly one hundred historic gravestones in just four days’ time gave me the incentive to join Maine Old Cemetery Association and a passion to continue MOCA’s work. Town Sextons & Cemetery Committee Members will learn and practice new – perhaps better – methods and materials for gravestone repair and care as well as have opportunities to network with others with similar position of responsibility. Historical Society members who often volunteer to take responsibility for maintenance of a dozen or more of their community’s historic burial grounds will benefit from workshop knowledge, hands-on experience, and collaboration. Educators & Students recognize the value of our historic cemeteries as learning laboratories. Maine Learning Results Standards call for integration across curricular areas with emphasis on application of newly-learned skills. Cemeteries offer countless authentic learning opportunities; History, Art, Geography, Ecology, Economics, Mathematics, Technology, Anthropology…. as well as lifelong community service. Church Members who have an affiliated cemetery for which their parish is responsible ~ this was the case at MOCA’s last 4-day workshop in 2014, held at the old burying ground adjacent the church at Wiley’s Corner, St. George, ME. In short, ANYONE who wants to know the correct means, methods and materials to properly care for their family’s and community’s burial plots and gravestones! You must REGISTER BY AUGUST 1st, 2016 ~ SPACE IS LIMITED, SO REGISTER EARLY. Ideally participants will attend all four days, but that’s not always possible. We can not forecast what activities will happen on which day, as the instruction and practice are based on what onsite damage we find as we work in the cemetery. There is NO registration fee for this workshop. MOCA urges workshop participants to donate generously as they are able to help cover workshop expenses of about $1,000 per day. Don’t hesitate to register based on your ability to donate, however. Our goal is to promote the use of correct materials and practices when working in cemeteries and to encourage workshop participants to share the skills they learn. Visit our MOCA Facebook Group. Great posts! May 17 through 23 is recognized as Maine Old Cemetery Week by the Maine Old Cemetery Association as a continuing part of its mission to encourage and support the preservation, maintenance, and study of old cemeteries. MOCA President Clyde Berry, encourages local historical organizations, civic associations, Boy and Girl Scout troops, and fraternal and veterans groups to lead community projects to care for local burial grounds in preparation for the Memorial Day holiday, May 25. On May 16, MOCA will kick off the annual observance with its Spring Program, May 16 in New Gloucester at the First Congregational-Christian Church. The church is located at 19 Gloucester Hill Road. The Spring Program features a report on the intricate carvings of 19th century stone carver Bartlett Adams (1726 to 1828). While MOCA encourages the active care of burial grounds, Berry discourages members of the public from undertaking cleaning or repairing gravestones without appropriate training. A Cleaning and Leaning Workshop will be held May 23 in Waterboro, hosted by the Waterboro Cemetery Committee. The workshop is MOCA’s program of Cemetery DOs and DON’Ts. A $20 donation is requested for registration including a pizza lunch. More information is available from Angela M. McCoy of the cemetery committee at (207) 651-1059 or angelamccoy@waterboro-me.gov. As individuals and groups visit local cemeteries during Maine Cemetery Week and/or on Memorial Day, they are encouraged to report any cemetery vandalism or damage they may observe. These should be first be reported to local authorities, but also on the MOCA website. Collecting data on vandalism and/or theft is MOCA's way of tracking vandalism trends and of compiling information to help as it advocates for changes in cemetery law.